Dr. Victor Médard de Chardon, qualified in injection and filler techniques (Paris V University) and a member of the QMed–Galderma Expert Group, uses injectable products which have been scientifically evaluated, and the efficacy and innocuity of which has been proven. This products are specifically: Restylane™/Perlane™ from laboratoire Q-Med™, Emervel™ from laboratoire Galderma™ and Juvederm™/Volbella™ from laboratoire Allergan™. What are the objectives of a hyaluronic acid injection? Hyaluronic acid is naturally present in the skin. It concerns a molecule which attracts and retains water. An injection of hyaluronic acid increases the skin&apos;s hydration levels as well as the volume of the injected area. Injectable hyaluronic acid can be injected, that is to say, to remodel certain parts of the face (injection of the lips, injection of the cheeks…), or to fill wrinkles, folds and other depressions in the face (injection of the under-eye area, lines, etc.) see photo on the right), or to hydrate the skin. Hyaluronic acid is a biodegradable product, which explains its excellent tolerability. 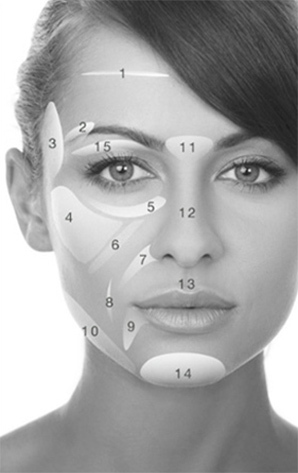 The durability of the result of hyaluronic acid injections is variable depending on the reticulation of the hyaluronic acid, the lifestyle of patients, skin type, age and the injection technique used. From what age can an injection of hyaluronic acid be performed? Flexible cannulas (Softfil™ or Magic Needle™) do not cut the skin or underlying tissue. The needle tip is blunt and does not cause any trauma to the tissues. These cannulas are supple and flexible unlike sharp needle tips which are rigid and cause more trauma. WRINKLES ON THE FOREHEAD filling wrinkles using hyaluronic acid is usually envisaged when a wrinkle persists following an injection of botox. EYEBROW TIP: an injection of hyaluronic acid at the end of the tip of the eyebrow gives a slight lifting effect to the tip of the eyebrow. TEMPLES: the temples become thinner and more hollow with age. An injection of hyaluronic acid gives a facial rejuvenation effect by restoring volume to the temples. CHEEKS: the lateral malar unit of the cheek can be insufficient due to constitutional or age-related issues. A moderate injection of hyaluronic acid in the cheeks enables them to be redefined naturally. DARK CIRLCES: dark circles give the face a tired look. Dark circles partly are party caused by a depression between the lower eye lid and the cheekbone and partly due to darker pigmentation. Treating dark circles with hyaluronic acid creates a less tired look due to filling the depression but does not usually act on residual pigmentation. Further information: injection of dark circles. JUGOMALAR FOLD: with age, a fold starts to appear and begins to divide the malar region and the cheek (mediojugal fold). An injection of hyaluronic acid fills this fold and creates a rejuvenating effect on the face. JUGAL WRINKLES: wrinkles in the cheeks and at the corners of the mouth can be filled with hyaluronic acid injections. MARIONETTE LINES: marionette lines are also known as puppet lines. These wrinkles are treated with filler injections. OVAL OF THE FACE AND JOWLS: when facial ageing is in its early stages, the oval of the face and jowls can be treated with fillers (hyaluronic acid or radiesse). These injections enable the contours of the face to be harmonised and for a non-surgical mini face lift to be performed without scarring. At a more advanced stage of ageing, a face lift and neck lift is necessary. LION WRINKLES: filling lion wrinkles (wrinkles of the glabella) using hyaluronic acid is usually envisaged when a wrinkle persists following an injection of botox. CHIN: an injection of hyaluronic acid in the chin improves the look of a receding chin or to fill a wrinkle between the chin and the lower lip. Photo showing example of result: hyaluronic acid injections in Cannes. EYELIDS AND EYE AREA: with age or due to a constitutional issue, the upper eye lid can become hollow (giving the look of "sunken eyes"). Treatment for this issue is certainly not surgery of the upper eyelids using a blepharoplasty, which would exacerbate the appearance of sunken eyes. Rejuvenation of the eye area is obtained using an injection of filler (hyaluronic acid or lipostructure) on the upper eyelid and the inferior edge of the superior orbital rim. Result from a hyaluronic acid injection: the result is immediate. This is slightly over-corrected due to mild oedema which disappears in 48 hours.Maintenance of the result: the hyaluronic acid injections are performed once a year.